Washout The Right Way – The Easy Way! 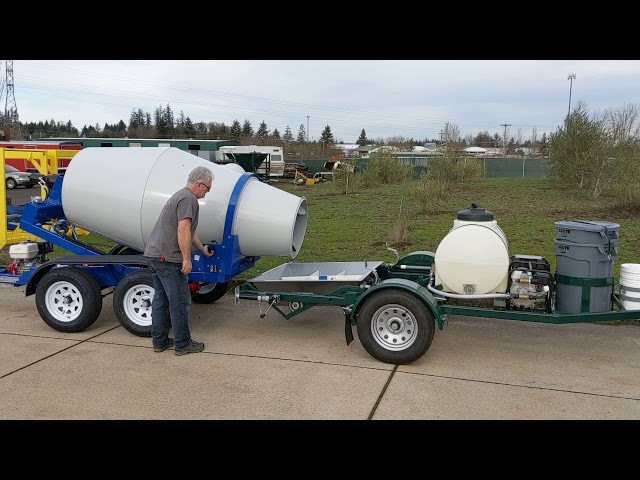 This friendly self-contained portable concrete washout system is set a-top a trailer that can be easily towed by a pickup truck or be left at a job site for convenient access. 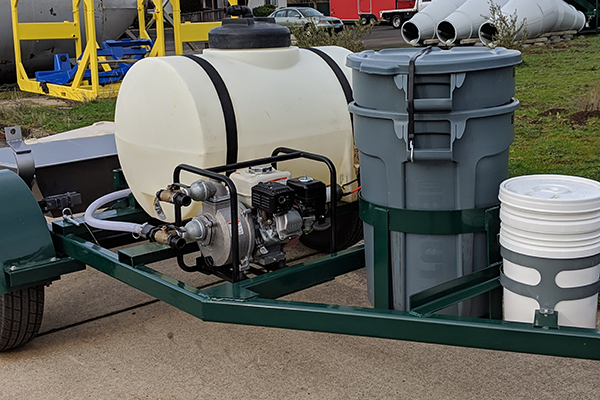 This well-designed washout system eliminates the need to find specialty trucks or heavy cranes to remove washout from the job site. The on-board water tank, pump, hoses and plastic containers allow for various water and solids separation processes. This can be your rolling concrete-waste recycling center. 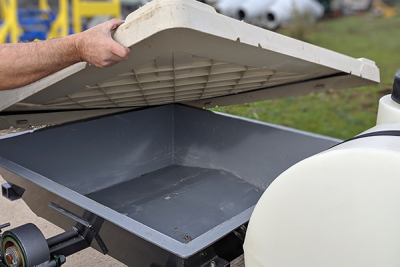 Waste concrete can remain in the bin indefinitely and only needs to be dumped when the bin is full which is about 20-30 total washouts. top quality components from the best suppliers. 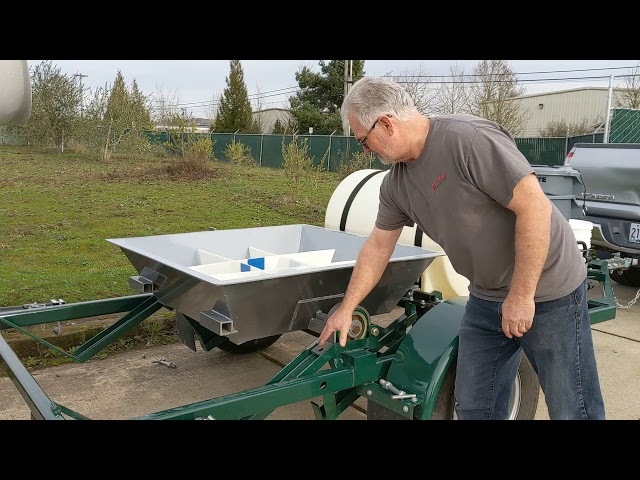 The washout tub can move into two positions depending upon use. The upper transport-position is for transit-mix washout and the lower position is for Cart-Away mixing trailers. 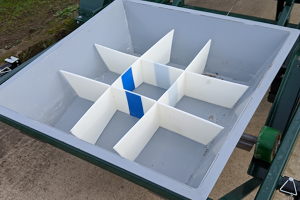 The plastic grid-dividers in the washout tub separate the solids to make “pier-sized” disposable blocks. Water is pumped off the top into plastic containers for further settling and recycling. Water can be pumped into a mixing drum or into the holding tank. Hardened concrete waste is dumped from the tub using the “hand-tilt” function. 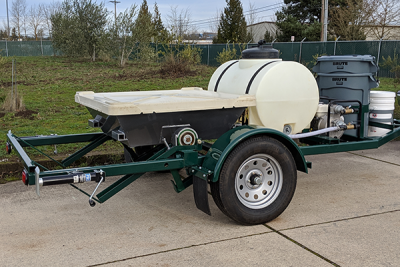 This trailer comes completely assembled with the tub, tub cover, water tank, 5-HP, pump, valves, strainer, hoses, hook, buckets, and brush. 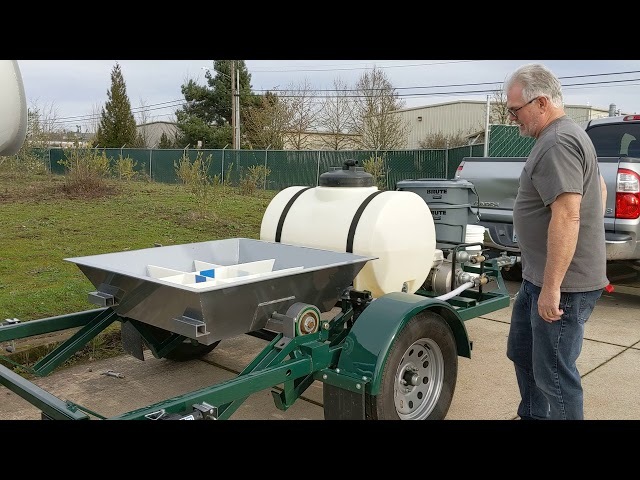 The Washout Trailer is the perfect compliment to many of our standard selection of mixers. The washout trailer is the perfect on-the-jobsite trailer that keeps you working and your job site clean. Call us today for a quote!